Infrastructure of mobile networks needs reliable monitoring of background technology of cooling, heating and building/site conditions. This solution describes some varieties of monitoring and alerting. A mobile carrier operates a country-wide system of Base Transceiver Stations (BTS). The BTS system is the part of a GSM network that is responsible for the reception and transmission of radio signals from mobile phones. A Base Transceiver Station is a general description of equipment consisting of the telecommunication technology and the air interface of the mobile network (GSM, UMTS etc.). To achieve high reliability, the operating temperature must be kept stable. This is achieved with an air-conditioning (A/C) unit, usually located in the top part of the technology cabinet. However, AC units are expensive and there is still a risk of malfunction. In addition, a back-up power supply must be ready to overcome any power failures. The customer also wants to be alerted if there is someone near the BTS. Ares 10/12 is a suitable product for monitoring the temperature inside the cabinet and signaling an alarm if the temperature starts to rise. The product can detect A/C failures, or temperature changes as small as one degree. 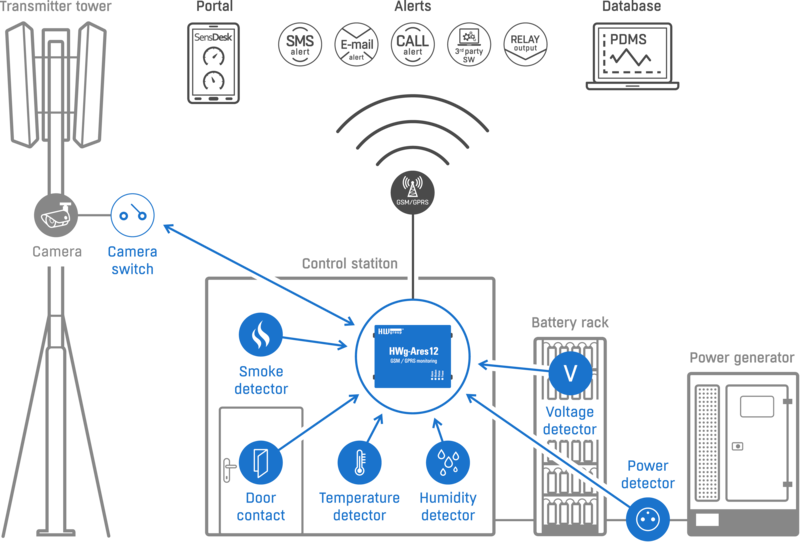 Besides the Ares device for temperature monitoring, a complete solution can be deployed, including power back-up. It is necessary to purchase a UPS with sufficient capacity. BTS also frequently contain batteries. Therefore, a device capable of monitoring the UPS voltage and battery capacity is needed. The UPS 12 and 5V product provides a suitable solution. It can power smaller sensors if needed. The Ares device can be complemented with a wide range of sensors, such as motion detectors. For example, the PIR JS-20 motion detector and door contacts.